Posted On April 05, 2018 by Team iCynosure. India is a country of traditions where every festival, every occasion, every celebration is a multi-day affair; some with super intricate rituals and numerous functions. And those are the days when we throw caution to the wind and indulge in the extremes, be it elaborate decorations, sumptuous food, crazy music or traditional fashion. Ethnic wear and Indian celebrations go hand-in-hand. However, most people make the mistake of de-accessorising ethnic wear, which ultimately ruins the entire look. Fashion trends come and go, but the staple look always remains the same - a great outfit, complimented with beautiful traditional jewellery, flattered by some gorgeous heels and completed by designer handbags. As a fashion stylist, I would at times compromise on things other than a handbag, but I know for a fact that only a perfect, outfit-appropriate hand accessory can do justice to an ensemble and make the person an iCynosure of the occasion. Not many think about a handbag when the outfit in itself is so enchanting. The easiest thing for anyone would be to dig into the pool of handbags, that you think will be complimentary and head out. But that sure isn't going to make any heads turn. You need to know which type of bag you shall need and when to carry it to look like an ace in the fashion game. The potli bag has undergone some serious changes from the days our great-grandmas carried them until today. With new twists of embroidery and embellishments, the simple ladies carry purse has now taken the fashion world by storm. Perfectly complimentary with a saree, choli and even anarkali, the potli bag is now the most sought-after bag during Indian celebrations. The craze can be seen with every celebrity carrying designer potli bags and flaunting them away. A clutch bag has come into the spotlight for its structured shape, eased utility, effortless manageability, and overpowering appeal. The clutch bag steals the show at every occasion, especially when in multi-coloured hues or single toned in gold or silver. 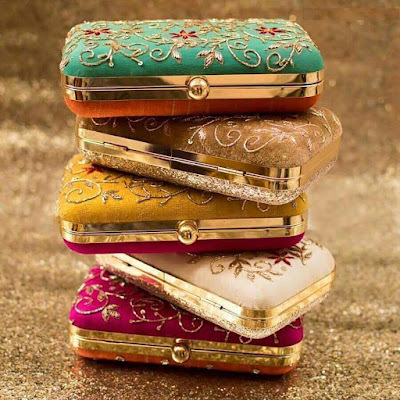 Perfectly complimentary with semi-modern traditional wear such as salwar kameez, half saree, etc; one can buy clutches online from numerous designer stores. 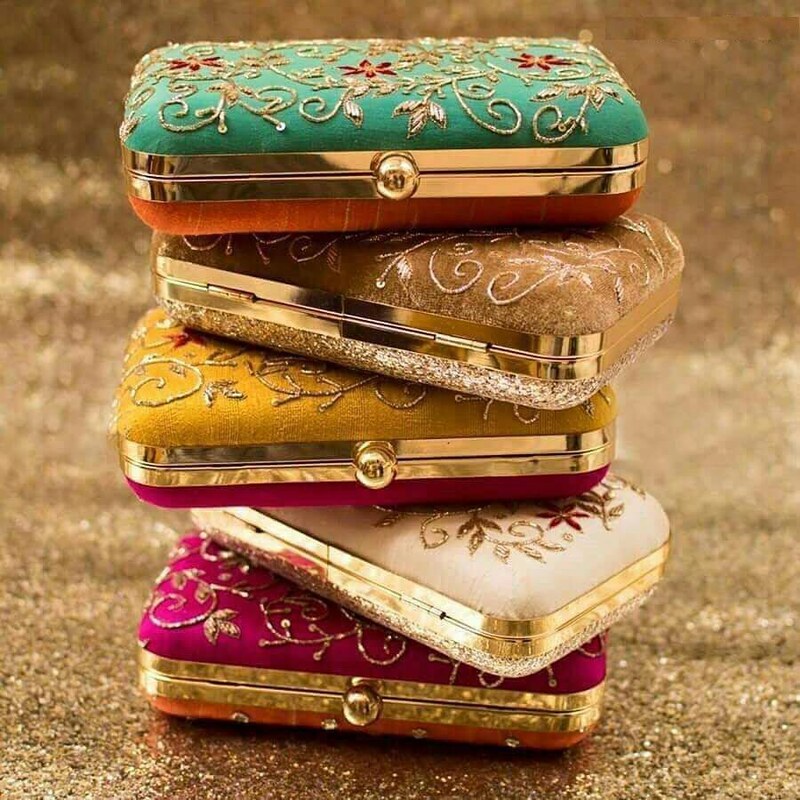 One can even get a clutch personalised to redefine their individual style statement. The most modern yet most un-apt bag that works wonders with traditional Indian outfits is the new age minaudière. The cute little royal wonder is the first choice of a true blue blood fashionista, that will take you from good to great. 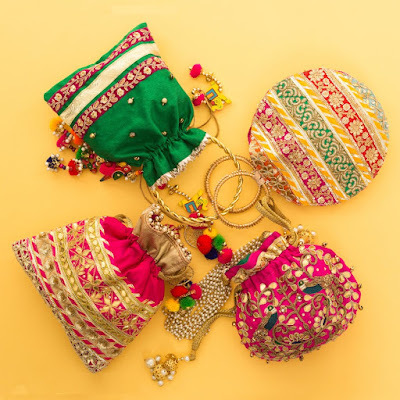 Perfectly complimentary with modern ethnic wear like saree gowns, cape sarees, lenghas, etc; a minaudière though a bit too small to fit in all that you may need is a great way to show off your personal style and strut like a pro. Do you agree with me? Let me know in the comments which are the types of bag you like to carry with your ethnic wear and why?